Invasion rules and participant codex. Every Eurolanche Invasion participant will be informed about the rules and the codex of the project. In case one chooses to participate, one needs to agree to both the codex and the rules. 1. The number of Invasion participants isn’t limited. An unlimited number of people may join the trip anytime. Eurolanche (hereinafter “Organizer”) may restrict the final number of participants only if a higher number of participants would complicate the overall organization and would substantially raise expenses. If such restriction is necessary, the Organizer would consider the order of the signed participants based on time, i.e. when a respective member sent his/her registration. 2. The pre-registration process for the next Eurolanche Invasion begins via a private announcement for the Eurolanche staff and the Yeti Ultras members, who may pre-register first. Finally, the pre-registration process for the rest of the Eurolanche members begins via a public announcement at www.eurolanche.com or via a newsletter. A pre-registration doesn’t commit a member to do anything; its sole purpose is to secure a place for him/her if he/she would ultimately decide to travel. 3. An approximate date of the next Eurolanche Invasion is announced usually in June, after the NHL releases the schedule for the upcoming season to those Eurolanche members, who have pre-registered themselves. The Organizer informs them about deadlines for the final confirmation of their participation. Usually, the final deadline for full registration (and payment for the plane ticket) is the first week of September. 4. Those Eurolanche members, who have serious interest in the Eurolanche Invasion and would be first-time participants, have to attend the Invasion orientation meeting. The presence of members, who were a part of one of the past Invasions as well as of members, who live too far away from the location of the meeting, isn’t necessary. The meeting may be organized before or after the registration deadline. The Organizer share all information via a Skype call with those members, who didn't attend a meeting. 5. All participants stay at the same hotel facility during the entirety of the trip with no exceptions. 6. The Organizer doesn’t guarantee free tickets for Colorado Avalanche games to Eurolanche Invasion participants. If such tickets are available, active Eurolanche members have the preferential right to receive them (if they take part in the trip). The rest of the available tickets will be fairly split between other participants. The Organizer helps all participants with securing their tickets for all games during the entire trip. 7. 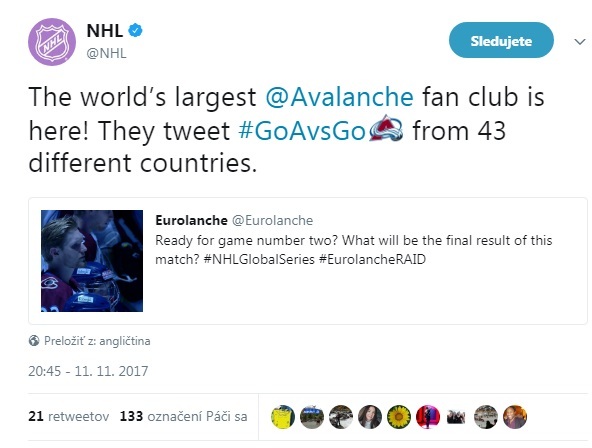 The Organizer doesn’t guarantee special tickets for post-game meetings with Colorado Avalanche players to Eurolanche Invasion participants. The Organizer helps to arrange alternate meetings with the players, if post-game passes are not available. 8. The Organizer is responsible for the overall organization of the Eurolanche Invasion – from arranging plane tickets (not buying them), accommodation, renting a car, through planning the entire schedule and trips to attend Colorado Avalanche games. The final schedule has to be approved by all participants of the trip. 9. All Eurolanche Invasion participants are required to pay an organizational fee, which is a part of the final event price. The only exceptions are members of the staff and members, who made special contribution to the Fan Club. 10. The Eurolanche Invasion is organized only with the participation of the Fan Club President. 1. I respect the other participants of the Eurolanche Invasion. 2. I understand that the Eurolanche Invasion project and everything that is part of the project are the result of all the hard work of the Eurolanche Fan Club, which linked with its history and the pursuit of establishing its brand. 3. I understand that my actions and behavior in public represent the Eurolanche Fan Club brand. I act and behave as good as possible. 4. I understand that not every Eurolanche Invasion participant has the same financial options as me. 5. I am adaptable, yet I can voice my opinion and/or make suggestions to change things. 6. I understand that the Eurolanche Invasion is mainly a group experience. The program of the group trips will be announced in advance. Changes may occur based on the situation, but they will also be announced in advance. 7. In a case I don’t want to have my own individual program, I meet times and dates in accordance to the program of the Invasion. 8. I follow the program with all its eventual changes announced in advance. I also follow all of the instructions given by the organizer. 9. I regularly check group information channels in order to be informed about possible program adjustments. 10. I understand that the Eurolanche Invasion is a unique trip with a given program and not a regular vacation, which for example offers options to celebrate until early morning. 11. I am responsible for my own individual program and how I adjust to the main program of the Invasion it is only up to me. 12. I am aware that in case of any problems and/or misunderstandings, I can privately contact the organizer of the Eurolanche Invasion. 13. I listen to the organizer. In case of any problems, I do everything to solve them. 14. I respect the organizer’s right to redistribute game tickets, with the staff and the Yeti Ultras members having preferential rights, and to distribute all the other tickets fairly for every other participant. This doesn't apply to those Yeti Ultras members, who participated at a meeting organized prior to a Eurolanche Invasion as their first (and only) Eurolanche event over the past two years. 15. I try to help other participating members during meetings with players. I don’t want anything from the players aside from signatures on my own souvenirs and/or memorabilia. 16. I support the Colorado Avalanche, no other NHL team. Repeated violations of the codex will lead to the participant’s exclusion from all activities of the on- going Eurolanche Invasions and from future Invasion trips. In case of a codex violation, the participant will be warned by the organizer.